Inspired by a life on the water, Costa Sunglasses has added four new styles to its Del Mar Collection originally released in 2018. The collection includes fresh designs collected from our watery world and feature colors, patterns and textures inspired by adventures on the water. The new sunglasses come in a variety of color options, including Shiny Ocean Current, and are aptly named for historic beach towns and islands – Apalach, Bimini, Coquina and Isla. The Del Mar Collection frames are constructed with Mazzucchelli acetate, a renewable, non-petroleum, plant-based material, with frame colors and designs mirroring the beauty of beaches, oceans and waterways. The sunglasses feature a custom corewire, visible inside the frame arm, with either a topographical or fish scale pattern tying back to Costa’s history of being born on the water. 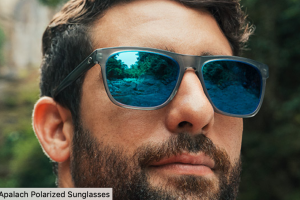 The new styles are available with Costa’s patented 580 Lightwave® Glass lenses, providing 100 percent UV protection and polarization while also reducing glare and eye fatigue. Costa’s lens technology combines the benefits of greater contrast and clarity with some of the most elegant, stylish frames available. Known for its oysters, pristine white sand beaches and maritime culture, Apalachicola is full of old-world charm in the heart of the Florida Panhandle. With sleek lines, Apalach offers an extra-large fit that will enhance your ocean views, and the new style looks good on multiple face shapes. Apalach is available in four color options – Shiny Tortoise, Shiny Black Kelp, Matte Gray Crystal and Shiny Sand Dollar. Bimini, named after one of the most iconic islands in the Bahamas, is a large female frame available in four colors inspired by the sea – Shiny Abalone, Shiny Vintage Tortoise, Shiny Deep Teal Crystal and Shiny Ocean Current. The epitome of island style, Bimini is a large cat-eye frame style perfect for soaking up the sun and the island’s rich history. The medium-fit Coquina frame conveys a relaxed, laid-back feel and is available in four bold color options – Shiny Ocean Tortoise, Shiny Vintage Tortoise, Shiny Deep Teal Crystal and Shiny Taupe Crystal. Named after one of the fine white sand beaches of Longboat Key, Coquina is the perfect companion for sunsets over the Gulf of Mexico. Coquina is a square-shaped frame with bold oceanfront style. Isla is a small round-shaped frame style available in four vibrant colors – Shiny Tortoise, Shiny Tiger Cowrie, Shiny Deep Teal Crystal and Shiny Seashell. Named after Isla Mujeres, a beautiful island in Mexico known for its crystal-clear turquoise waters, whale sharks, diving and white sand beaches, Isla is a must-have for activities on and off the water, and delivers an elegant vibe. The Costa 580® color-enhancing lens technology selectively filters out harsh yellow light for superior contrast and definition and absorbs high-energy blue light to cut haze and enhance sharpness. In addition, Costa’s lens technology reduces glare and eye fatigue, and its Lightwave glass is 20 percent thinner and 22 percent lighter than average polarized glass. The new styles range in price from $229 to $249 based on frame style, color and lens selection. For more information on the new frames and Costa’s full line of sunglasses, visit CostaSunglasses.com.